You’ve implemented security settings and receive regular reports of how your environment is doing, so you’re good to go, right? Not quite. Setting up a security plan is definitely the first step, and getting regular reports is absolutely important. But with today’s cyber security reality, you need real-time updates and alerts on what’s happening with your environment if you really want to protect yourself. Around 25% of the messages sent on Office 365 contain malware or phishing. And as a business owner, you need to know when these things happen so you can make sure your employees are not inadvertently putting your valuable data at risk. Alerts help you stop security risks before they infiltrate your organization. Is someone logging in from multiple devices and locations or sharing their password with unauthorized users? Maybe you have an employee who is prone to falling for phishing emails. With Office Protect’s monitoring features, you’ll be able to identify these internal threats and properly educate your users before they cause a serious security breach. Setting up security policies is just the first step. We all know that business and life get hectic and often interfere with our ability to focus on keeping up with security. However, hackers are always finding new ways to target businesses just like yours, so vigilance is essential to maintaining a secure environment. By setting up and customizing your alerts, you can be easily and quickly reminded of any threats to your environment and make appropriate changes. So what exactly will Office Protect monitor and alert for you? It turns out the answer is pretty much everything. Logs: Office Protect will record both user and administrator activities. And with the search feature, you’ll be able to dig in and discover any suspicious activity, or find the cause of a security breach if one occurs. Security Policies: You’ll also be instantly notified if any changes are made to your security policies, enabling you to quickly catch any hackers trying to weaken your organization’s security. Outbound Spam: Office Protect will alert you if anyone in your internal organization sends out something that could be flagged as spam. This is important because outbound spam can indicate that an email account has been breached and is now compromised. Administrator Access: Office Protect will not only monitor who has administrator access but also let you know if any administrators are engaging in behaviors that violate your security policy. Mailbox Activities: Everyone’s mailbox will be monitored and recorded to identify potentially harmful activities. Things such as missing or deleted emails, inbox rules that weren’t created by a user or administrator, and unusual signatures that were added will all trigger an alert. Sign-Ins: If anyone signs in from an unusual device or location, Office Protect will alert you. You’ll also be notified if there’s an unusual number of sign-ins in a short period of time, which could be a sign of someone bombarding your network to try to gain access. As you can see, Office Protect is set up to help you monitor threats from anywhere, inside or outside your organization. Everyone knows that hackers can deploy techniques such as phishing or social engineering to delete accounts, impersonate management, create new accounts for themselves, or change security settings. But not everyone realizes how sophisticated these attacks are actually becoming. Some hackers are even using social media to find the names of key employees’ spouses and sending phishing emails that way. You simply can’t afford to let down your guard. Whether accidental or malicious, some of the most serious threats can come from inside your organization. In fact, human error is the cause of more than half of all IT incidents. Office Protect lets you keep an eye on your employees in case they’re engaging in risky behaviors such as sending a large number of emails to an external source or letting an unknown person access their account. You can have all the data in the world at your fingertips, but it’s worthless if you can’t easily understand it. 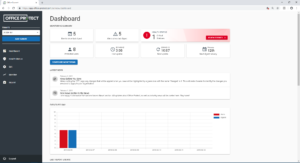 Fortunately, Office Protect works to make all of its monitoring and alerts easy to understand and accessible with a comprehensive dashboard that you can view at a glance. When you log in, you’ll instantly see a summary of all your events and alerts since the last digest (report), as well as your configured events and alerts. You can also view protected users, an update schedule, and the next digest delivery just from the initial view. By scrolling down, you can see a full list of recent events that you’ll want to monitor and possibly take action on. You can also change your profile and customize your individual settings from this screen. All of these options are simple drop-down menus that are very intuitive to use. The left-hand side of the page contains your monitor menu. When you go into it, you can view a list of all possible events that Office Protect monitors. You can then choose to either be alerted about each of these, have them appear in your regularly scheduled reports, or not be notified about them at all. If you choose to be alerted, you’ll receive a notification of the event usually no later than thirty minutes after the event occurs. Digests are generally sent out weekly. Would you rather deal with security incidents after the fact or simply prevent them in the first place? Most would choose the latter—proactive maintenance is essential when you consider the growing list of cyber threats that organizations face. Office Protect’s monitoring and alert system are key players in your overall security portfolio. By fully utilizing all of these features, you can stop cyber crime before it’s even committed and keep your organization safe.